As part of my efforts to lose weight, I have been adding more fruits and vegetables to my diet. I have especially been focusing on fruits that are high in antioxidants, like cherries, since they are known to be a great post-workout food for preventing muscle inflammation. Not only are they are a fantastic antioxidant, but a natural source of melatonin, an ingredient known for helping you get a better night’s rest. While cherries and especially tart cherries are very healthy, it is hard finding them when they aren’t in season. Even worse, many companies who sell frozen or preserved cherries don’t use the best quality, organic cherries, leaving you wondering what else may have been frozen into your delicious treat. 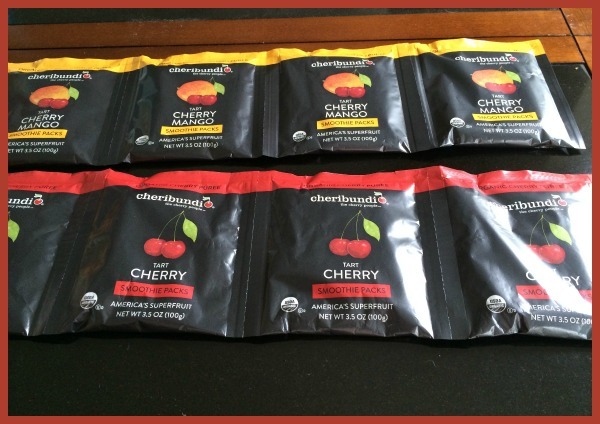 Recently, I learned about a new, organic company that provides a variety of organic tart cherry options – Cheribundi. Curious to try their products, they asked me to review their latest products – their Tart Cherry Smooth Packs and their Tart Cherry Mango Smoothie Packs. Looking for delicious products made with high quality tart cherries? If so, we think you will love Cheribundi! They are proud to use cherries harvested from their local orchards in Geneva, NY. Each of their juice pouches contains 50 tart cherries, to help with a great night’s sleep, promote healthy moderation of inflammation responses in the body, and, of course, taste great! With all the amazing beverages sold by Cheribundi, you can easily find the right healthy drink for you! Over the years, I have tried quite a few smoothie packs. Some that were natural, some that were recommended as part of diets. Cheribundi’s smoothie packs, however, may very well be the best smoothies I have tried yet. What makes them so amazing so the fact that they are simple – just pureed cherries or cherries and mangos. Before making the smoothies, all you do is put the individual packs in the freezer, take it out when ready, put in my blender with your favorite frozen fruits, milk, ice, or water, and blend to make the perfect smoothie. For mine, I added a half cup of milk and a frozen banana to make some of the most delicious smoothies. Based on my own experience with Cheribundi’s Tart Cherry Smooth Packs and their Tart Cherry Mango Smoothie Packs, I am happy to give both of these products an A+ rating and highly recommend them for anyone who loves smoothies! Would you love to try these individually packaged smoothie packs for yourself? You can purchase the Tart Cherry Smooth Packs and their Tart Cherry Mango Smoothie Packs, along with their other products, at Whole Foods. To see other locations that sell Cheribundi, make sure to check out their store locator. Also, make sure to check them out on Facebook, Twitter, and Google+ to learn more about their awesome products! Disclosure: Budget Earth did not receive compensation for this review but did receive free product for review purposes via Tomoson.com. All opinions on this product are my own and may differ from our readers’ opinions. I love smoothies. Especially the pre-made type. So much less mess. I have had the Cheribundi drinks and they are so delicious, but I never thought about making a smoothie with them, and did not know they come in a smoothie pack. . I will have to try this!! I havent tried the smoothies but I have tried their juices and teas which are really good. These sound like a great way to keep your weight under control. I will have to look for this product at Whole Foods. I am always trying to try different ways of getting fruits into my diet.